With Kelley’s The Crazy Ones soon to debut on CBS, I thought it might be interesting to look back on his career, which has featured a number of big-time successes and a few weird choices as well. Although it’s problematic to head down a road where we’re assigning a series’ creative output to one individual, pilots often give us the best representation of a writer’s vision for a project. So hopefully the next few entries won’t dive too deep into overly auteurist considerations of Kelley’s work, even if myself and my guests will be looking for ongoing themes and through-lines. Kelley’s place in history is fascinating: Is he anything close to a real innovator or just someone who did one thing really well for far too long? Is he an ally (see what I did there?) to women or just a Patronizing White Dude? Or, is he all those things? We’ll try to figure it out as best as we can. Our second foray into Kelley television is the first show he created on his own, Picket Fences. The CBS drama debuted in the early 1990s, borrowing from a number of different, arguably better, shows that aired on other networks. Although never much of a big hit for CBS in its four years on the air, Picket Fences scored a number of Emmys and Golden Globes, including two Emmys for Outstanding Drama Series. Cursory Internet searches suggest that the show still has some dedicated fans around the web, but this isn’t something we hear much about in 2013, even in the context of David E. Kelley’s work. Does it hold up, and how it does it signal some of the later, perhaps more generally popular, work that Kelley would do? Joining me today to figure that out is Wesley Mead. He is is a twentysomething British IT worker and voracious pop-culture consumer. From the cinema to the TV to the smartphone, he spends rather more time than is healthy in front of brightly-lit screens. He lives with his fiancee, their chinchilla, and a collection of far, far too many DVDs. Read his Imported Goods column at The Ann Arbor Review of Books, and follow him on Twitter @wesleymead, where you can appreciate his dashing English wit in all its naked glory. Wesley: I consider myself a fan of David E. Kelley. Boston Legal rates as one of my favorite shows of the last ten years (I know, I know); I still hold the early seasons of Ally McBeal in high regard; and I’ve spent the last seven years wishing more episodes of The Practice would hit DVD. But I’ve not invested much time into testing his earlier work: Doogie Howser never really appealed, and falling in love with Chicago Hope would feel like cheating on my beloved ER. I’m not really sure what’s stopped me getting into Picket Fences, though. I bought the season one boxset when it was on sale a couple years back, but for whatever reason, I’ve never found the time to delve into it. I suppose I was wary of it proving Kelley-lite, a stepping stone on his way to more exciting things. Yet watching the pilot for this column, I was struck by just how many of the David E. Kelley trademarks were already in place in this, his first sole-created show–even if they were still finding their feet a little. The first episode of Picket Fences introduces us to the quaint, quirky town of Rome, Wisconsin. We cold-open on a community theater production of The Wizard of Oz. The Tin Man falls to his death, on-stage, for reasons unknown. Kelley’s penchant for blending the sublime and the ridiculous, the light and the dark, is already in full force, a mere ninety seconds in: “he looks blue, he’s supposed to look grey!”, one onlooker calls out. The subsequent 90 minutes (it’s a double-length, slow burn of a pilot) takes a look at how the town’s “first murder in a decade” impact the varied and sundry residents. Cues are clearly taken from Twin Peaks and Northern Exposure: the offbeat, off-key small-town dramas in vogue dominating critical conversation at the time. Kelley whips those elements into something new, though. There’s the dark, seedy, central mystery, but it’s contrasted with gloriously offbeat comedy. There’s the police procedural side of the story, but there are subplots shifting from wry and witty to dark and sordid so rapidly you’re liable to give yourself mood whiplash. There’s even family elements vaguely reminiscent of thirtysomething–a side of life that Kelley would rarely deal with on future programmes. It all adds up to a diverse boiling pot of ideas, concepts and tones, another feature that would recur in much of Kelley’s later work, for better or worse. With Picket Fences, it works mostly for the better. This pilot is an enjoyable ninety minutes of television, and the central mystery surrounding who killed the Tin Man–with liquid nicotine, as it turns out–is a compelling one, with satisfying twists and turns. I appreciated that the show looked at the central case from all sides, including the personal. It makes for a distinct change from the more typical legal procedurals which overwhelmingly focus on investigation and/or prosecution. The core cast in this pilot make for an interesting combination. The central family–that of Sheriff Jimmy Brock, chief investigator of the Tin Man murder–are so much quieter and more reserved than the character Kelley would later go on to create. 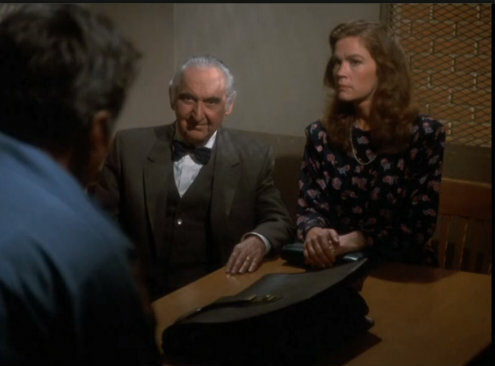 Jimmy and psychiatrist wife Jill are realistic, natural people; he uses their two sons and one daughter (the latter from a previous marriage) as a jumping-off point for low-key, small-scale family drama, and a subplot involving youngest son Zack being bullied at school even allows Kelley to invoke a bit of monologue grandstanding, elementary school style. Meanwhile, Jimmy’s co-workers at the police station work as grounded adults, their personal relationships intertwining with their working lives. One Twin Peaks-y subplot sees Officer Kenny get involved with the singer who’s come to town on tour; she turns out to be involved in prostitution, a story that becomes the source of both dark drama and wry comedy. Elsewhere, though, reality is a tad more heightened. Sheriff’s Office receptionist Ginny vaguely recalls the quirk of Moonlighting‘s Agnes, with added hysteria inducement. The highlight is Fyvush Finkel’s offbeat lawyer Douglas Wambaugh, a clear precursor to Boston Legal‘s Denny Crane; in response to one attempt at prosecution, he claims the case is “black and fudge-like stool” and he’s “seen flu phlegm with more substance.” He wouldn’t last for five minutes in the real world, but this is a David E. Kelley show, and that matters not a jot. He makes for entertaining, ridiculous, wordy television, and his presence is probably the highlight of a uniformly talented cast. As the pilot progresses, the blend between the comic and the dramatic becomes a little smoother. The turns the plot takes–the revelation that the Tin Man, a teacher at the town school, was having a relationship with a 16-year-old student; the fact his wife knew; that she turned out to be having an affair too–straddle a solid line between Twin Peaks dark and David E. Kelley-lite, with the near-conclusion “dishwasher” scene a giddy highlight, a graphic, pitch-black absurdity that somehow works despite itself. That Kelley and co. play the quirk so straight adds to the effect. A fake-out twist involving a poisonous-fruit “confession” works well: initially in terms of dramatic irony and later in terms of making a surprising amount of sense of a complex case. Picket Fences‘ Rome, Wisconsin looks very early-’90s: heavy make-up, dated clothes and soft-focus shots abound. But the cinematography is very solid by the era’s network standards. One excellent shot pans across shocked onlookers from behind a lit-up police car. Establishing shots, while cheap-looking, are varied; set exteriors are warm and cosy-looking, lending authenticity. It all contributes to making the town feel real and full-fledged, even within this one pilot. Music plays a key role in this episode too, which I found an interesting precursor to its becoming a crucial element in Ally McBeal. There’s the opening Oz performance; there are several sequences of Zack playing trombone, including a “Dueling Banjos” with sax-wielding dad; there are multiple performances from the Contrition Sisters, the singers visiting town; there’s an “Over the Rainbow” performance at Tin Man’s funeral; and the episode concludes with a surprisingly saccharine family rendition of “Blueberry Hill.” And, of course, there’s the theme tune, which strikes as more network-mandated than Kelley-approved: it’s distinctly early-90s, lengthy, syrupy and dramatic; it strikes me as something that would belong on a cheap soap. I’d almost say it was going for parody if I didn’t know Kelley never had any troubles embracing heart-on-sleeve emotion; as it is, it’s bizarrely patriotic, melodramatic, and on-the-nose. TV Guide, better placed than most to select the wheat from the TV history chaff, featured Picket Fences on their lists of both the greatest TV episodes and TV characters of all-time. (The episode got dropped from their 2009 update, though.) Based on the pilot, I can’t say whether it’s worthy of such accolades, but it strikes me as an important piece of David E. Kelley history, the show where he honed his craft and hammered down a distinct, unique style. The limitations of the era, the network, and Kelley’s own learning curve prevent Picket Fences‘ pilot from being an outright classic, but it’s a very watchable melange of material, and to watch the tonal shifts and dramatic twists unfold before you is an experience indeed. I hear future episodes strike a similar balance, bizarre crimes coming up against unusual people and domestic drama, and I’m intrigued to see how that plays out for four more seasons; I won’t be waiting another few years before checking out episode two. However, the more I thought about this opening 90 minutes (and lord, double-length pilots are almost exclusively painful to get through), the more I realized that Picket Fences is in fact familiar in the larger context of Kelley’s work because it often feels like the accumulation of a bunch of better things, with a slightly different touch. That’s not necessarily a knock on Kelley as a writer or showrunner–and clearly his long-successful career and numerous awards prove that some people, somewhere like him–but so many of his projects fit this pattern. L.A. Law played like the cheesier, headline-baiting version of Hill Street Blues. Chicago Hope had the worst timing, forever linking it to the better ER. Both The Practice and Ally McBeal could top peer Law & Order in a given episode, but they also regularly felt they were trying too hard to tap into a certain cultural milieu. Although Kelley made a whole lot of great television in the 1990s and his shows took over some of the larger pop culture discussion at a given moment, they’ve also been surpassed both their respective contemporaries. Picket Fences is like that too, as its Emmy-winning pilot manages to recall just about every great late-80s and early-90s drama without really coming close to being as good as any of them. Wesley did a tremendous job of breaking down how this opening episode signals Twin Peaks, Northern Exposure, and thirtysomething. Those three shows have more differences than similarities, but Kelley’s Picket Fences seemingly puts them all in a blender and purees them to death, creating a final liquidy product that isn’t entirely without taste, but also just leaves you wanting to taste the better version. It’s a zany small town full of friendly weirdos with secrets! There’s a murder! But the family at the center deals with “real” issues too! I can just hear Kelley pitching this to CBS executives, who were at the time not airing one of the aforementioned shows. Although I can’t confirm this with facts or science or anything, it’s probably no surprise that Kelley swooped in at the end of the weirdo small town shows after Peaks and Exposure and effectively stalled the genre out on broadcast television with Picket Fences. Having seen more than a few episodes of both of those shows, Fences is the most straightforward of the three, which is nice because Twin Peaks pretty regularly didn’t make sense and Northern Exposure could turn up its specific type of charm too high at times. The characters in Rome are much more recognizable as everypeople who could be your neighbor, or your teacher, or your scumbag of a lawyer–as opposed to Peaks‘ group of weirdos, criminals, and true dirtbags. Similarly, the setting itself is more traditionally “small town” in that TV, midwestern kind of way–unlike Exposure‘s particularly Alaskan lifestyle. Nevertheless, the decision to both combine certain elements and scrape away the “Weird Stuff” means that there’s not much here worth remembering either. At times, it feels like Picket Fences is searching for certain kind of ‘oddball quotient,’ where it wants to throw out some random things in hopes of giving Rome some character and texture, but there isn’t always a purpose for it. The opening sequence with the Wizard of Oz performance fits that mold pretty clearly, wherein it mostly exists to get a brief laugh out of adults participating in this community performance and to signal that hey, this isn’t your normal small town. The ultimate reveal that the female performers just passing through town are hookers is meant to be shocking in the same way, and it works a little better because it helps establish some characters, but you get the sense that Kelley thought these moments would be very scandalous (and at the time, maybe they kind of were). These moments aren’t bad, and they’re generally well-acted from scene-to-scene, but the pilot runs into that no man’s land where it’s simply not weird enough for the amount of effort it’s putting in to seem weird. Consequently, this 90 minutes is a slog to get through. The additional time gives Kelley the space he wants to sketch out individual members of the community and their various complex relationships and in those moments, Picket Fences generally works. Like our topic last time Doogie Howser, Picket Fences gets by quite a bit on the back of its leading man. 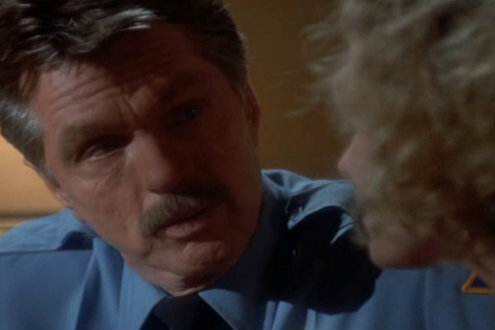 This time it’s Tom Skerritt, who just looks like he was born to play a local Sheriff that tries to balance his family life with the knuckleheads at work. Skerritt’s brings a nice combination of warmth and managerial bluster to his role as Jimmy Brock and he’s well supported by his own-screen wife Kathy Baker. The pair center the show with a relationship between two town figureheads and the pilot immediately puts their professional differences front and center as the murder investigation unspools. However, unlike Wesley, I wasn’t especially charmed by the case itself, which probably dominates the running time for much more than it should. The murder investigation and subsequent legal maneuvers certainly create the entry point to display just how many of Rome’s people are engaged in illicit and/or secret behavior, but it also allows Kelley to get lost in the kind of procedural posturing that he’s always enjoyed. As usual, those parts of the pilot are well-constructed and the investigation has the right number of twists and turns to sustain the whole running time, but the procedural engine is kind of at war with the fascinating more textured small town dramedy elements of the pilot. There’s no guarantee that with more time, the characterization and world-building would have been better, but it’s hard not to think of how David Lynch and Mark Frost used Laura Palmer’s death as an entry point into all kinds of seedy situations going on in Twin Peaks. The comparisons aren’t necessarily fair, but Picket Fences basically asks for them and unfortunately for Kelley, his pilot doesn’t excel in that way, at least not on the same level. 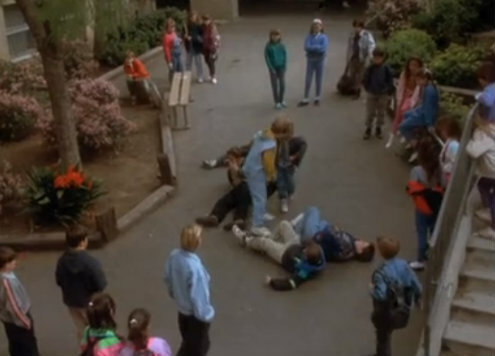 The Picket Fences pilot is fine, but watching it recalls a number of other, better shows that Kelley appears to be aping, or at least trying to bounce off of. Yet then again, that’s kind of a nice way to describe Kelley’s career, at least in my mind. He’s always making solid shows that can be interesting and even very good. But they often come off as watered down recontextualizations or summations of things that are being done better elsewhere. Conclusions on legacy: Worth watching, particularly for Kelley completists, but a reminder that his best stuff was still yet to come. Previously on Test Pilot: Doogie Howser, M.D. To each their own, I suppose. To me Picket Fences still remains by far and away the best thing David E. Kelley ever did. The Practice was good though, and the first season of Chicago Hope was okay. I hated Boston Legal and Ally McBeal — I thought they were stupid and trashy.